KANSAS CITY, Mo. — For the third day in a row, the American Red Cross is helping those without power have a place to stay warm and have a meal to eat. 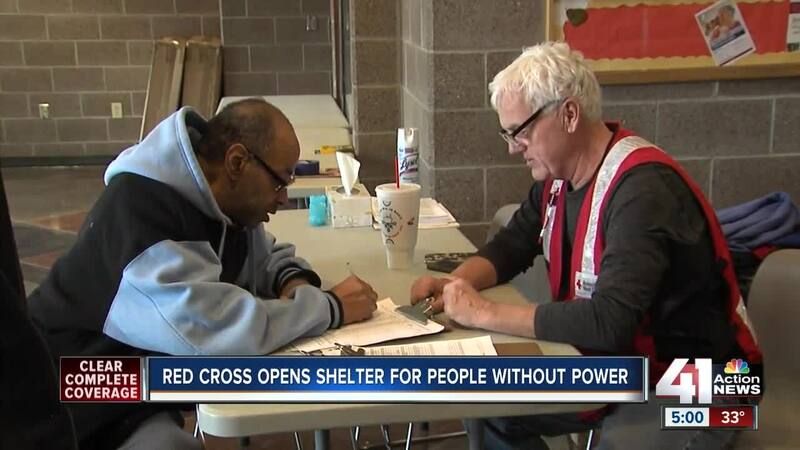 The Red Cross first opened the Hillcrest Community Center in South Kansas City Saturday as a warming shelter then as the storm escalated, they changed it to an overnight shelter. "I could come in at any time when I wanted to come so I came because it's too cold in the house it was colder in the house than outside," Marvin Johnny, a KCMO resident without power said. Approximately 40 to 50 people stayed the first two nights and 22 stayed at the shelter Monday night. "Everybody is so kind. That's the one thing that really impresses all of us; is that everybody is in this together and we get along. Everybody knows lights out at 10 no disagreements about that. TV doesn't come on until 7 a.m. because people are still sleeping and everybody is very cordial about that," Mike Oiler with the Red Cross said. Anyone going to the shelter is encouraged to bring their medications, clothing, and important documents.